The dust was flying at the Sukanen Ship Pioneer Village and Museum Antique Tractor Pull, but with many of the tractors dating back to the '20s and '30s, some might say the weather conditions added to the authenticity of the setting. "If you sat out on a tractor like that, whether it was dusty, windy, cold, no matter what your were covered in dirt and freezing," said tractor owner Alex Rhead, pointing to one of the antiques. "Now they've got the cabs on there and you could go out there in a tuxedo and probably not get any dirt on you." Museum volunteers got the museum's machines up and running and invited any owners of antique tractors to come out for some good, old-fashioned fun. Roughly 20 tractors were hitched to the large tractor pull sled Sunday afternoon, while the drivers showed the crowd what the engines could do. The object of the game is to pull the sled, loaded down with seven tons of steel, as far as the tractors can go before the weighed dolly reaches the end of the sled or the tractor spins out in the dirt track. To make things more challenging, a bucket at the front of the sled plows the dirt, adding to the resistance the tractor must battle. "It's just a demo to recall happier days," said Abe Giesbrecht, the announcer for the event. There were tractors of every make and model, from a 1928 McCormick Deering 1530 with steel wheels to slightly newer models like the 1934 Massey-Harris 44 Special that had progressed to rubber tires. Others even had rubber tracks. "It's part of our heritage. 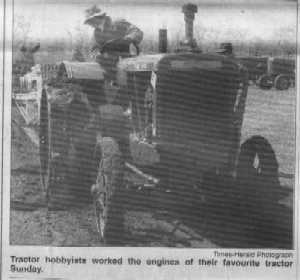 If these old tractors could talk they'd tell you quite a story," said Stan Bowes, who was keeping busy on his small tractor pushing the dirt back over the track after each tractor's run. "I was talking to one guy one day - he farmed years ago - and I asked him, 'How long did it take you to put the crop in?' He said, 'Long enough I got to know every gopher personally.'" Sparky Andrews owns two of his antiques. He said he couldn't quite determine what is was that attracted him to the hobby, but he knows he enjoys it. "There's just something that makes you want to go out and see if you can beat the other guy," he said. Up in the stands, two year-old Kali Dunlop was thrilled by the action below her. "We're watching tractors!" she said pointing to the field. With a thumbs-up she added, "They're pretty cool." Thomas McNeil, who was looking after the rambunctious Kali, was also impressed by the show. "I'm interested in it because I know when I go back (home) Grandpa's going to ask me about everything," he said.